Why Do Writing Skills Matter? Obviously you can write. And in the age of Facebook and smartphones, you may be writing all the time—perhaps more often than speaking. Many students today are awash in text like no other generation before. So why spend yet more time and attention on writing skills? Research shows that deliberate practice—that is, close focus on improving one’s skills—makes all the difference in how one performs. Revisiting the craft of writing—especially early in college—will improve your writing much more than simply producing page after page in the same old way. Becoming an excellent communicator will save you a lot of time and hassle in your studies, advance your career, and promote better relationships and a higher quality of life off the job. Honing your writing is a good use of your scarce time. If you want to be a professional who interacts frequently with others, you have to be someone who can anticipate and solve complex problems and coordinate your work with others, all of which depend on effective communication. The pay-off from improving your writing comes much sooner than graduation. Suppose you complete about 40 classes for a 120-credit bachelors’ degree, and—averaging across writing-intensive and non-writing-intensive courses—you produce about 2,500 words of formal writing per class. Even with that low estimate, you’ll write 100,000 words during your college career. That’s roughly equivalent to a 330-page book. Spending a few hours sharpening your writing skills will make those 100,000 words much easier and more rewarding to write. All of your professors care about good writing. By the end of high school you probably mastered many of the key conventions of standard academic English, such as paragraphing, sentence-level mechanics, and the use of thesis statements. The essay portion of the SAT measures important skills such as organizing evidence within paragraphs that relate to a clear, consistent thesis, and choosing words and sentence structures to effectively convey your meaning. These practices are foundational, and your teachers have given you a wonderful gift in helping you master them. However, college writing assignments require you to apply those skills to new intellectual challenges. Professors assign papers because they want you to think rigorously and deeply about important questions in their fields. To your instructors, writing is for working out complex ideas, not just explaining them. A paper that would earn a top score on the SAT might only get a C or D in a college class if it doesn’t show original and ambitious thinking. Professors look at you as independent junior scholars and expect you to write as someone who has a genuine, driving interest in tackling a complex question. They envision you approaching an assignment without a preexisting thesis. They expect you to look deep into the evidence, consider several alternative explanations, and work out an original, insightful argument that you actually care about. Compare the list you’ve generated with a small group of your classmates. How do their lists of writing assignments compare to your own? What are some common factors across writing assignments? What are some notable differences? Writing assignments can be as varied as the instructors who assign them. Some assignments are explicit about what exactly you’ll need to do, in what order, and how it will be graded. Some assignments are very open-ended, leaving you to determine the best path toward answering the project. Most fall somewhere in the middle, containing details about some aspects but leaving other assumptions unstated. It’s important to remember that your first resource for getting clarification about an assignment is your instructor—she or he will be very willing to talk out ideas with you, to be sure you’re prepared at each step to do well with the writing. Most writing in college will be a direct response to class materials—an assigned reading, a discussion in class, an experiment in a lab. Generally speaking, these writing tasks can be divided into three broad categories. Being asked to summarize a source is a common task in many types of writing. It can also seem like a straightforward task: simply restate, in shorter form, what the source says. A lot of advanced skills are hidden in this seemingly simple assignment, however. That last point is often the most challenging: we are opinionated creatures, by nature, and it can be very difficult to keep our opinions from creeping into a summary, which is meant to be completely neutral. In college-level writing, assignments that are only summary are rare. That said, many types of writing tasks contain at least some element of summary, from a biology report that explains what happened during a chemical process, to an analysis essay that requires you to explain what several prominent positions about gun control are, as a component of comparing them against one another. Many writing tasks will ask you to address a particular topic or a narrow set of topic options. Even with the topic identified, however, it can sometimes be difficult to determine what aspects of the writing will be most important when it comes to grading. Focus on the verbs. Look for verbs like compare, explain, justify, reflect, or the all-purpose analyze. You’re not just producing a paper as an artifact; you’re conveying, in written communication, some intellectual work you have done. So the question is, what kind of thinking are you supposed to do to deepen your learning? Put the assignment in context. Many professors think in terms of assignment sequences. For example, a social science professor may ask you to write about a controversial issue three times: first, arguing for one side of the debate; second, arguing for another; and finally, from a more comprehensive and nuanced perspective, incorporating text produced in the first two assignments. A sequence like that is designed to help you think through a complex issue. If the assignment isn’t part of a sequence, think about where it falls in the span of the course (early, midterm, or toward the end), and how it relates to readings and other assignments. For example, if you see that a paper comes at the end of a three-week unit on the role of the Internet in organizational behavior, then your professor likely wants you to synthesize that material in your own way. Try a free-write. 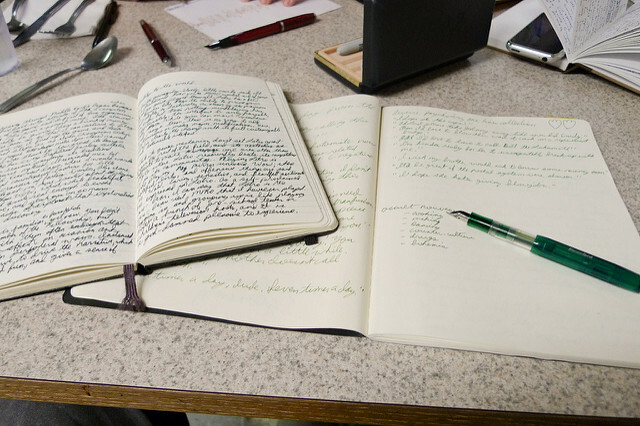 A free-write is when you just write, without stopping, for a set period of time. That doesn’t sound very “free”; it actually sounds kind of coerced, right? The “free” part is what you write—it can be whatever comes to mind. Professional writers use free-writing to get started on a challenging (or distasteful) writing task or to overcome writer’s block or a powerful urge to procrastinate. The idea is that if you just make yourself write, you can’t help but produce some kind of useful nugget. Thus, even if the first eight sentences of your free write are all variations on “I don’t understand this” or “I’d really rather be doing something else,” eventually you’ll write something like “I guess the main point of this is . . . ,” and—booyah!—you’re off and running. Ask for clarification. Even the most carefully crafted assignments may need some verbal clarification, especially if you’re new to a course or field. Try to convey to your instructor that you want to learn and you’re ready to work, and not just looking for advice on how to get an A. Although the topic may be defined, you can’t just grind out four or five pages of discussion, explanation, or analysis. It may seem strange, but even when you’re asked to “show how” or “illustrate,” you’re still being asked to make an argument. You must shape and focus that discussion or analysis so that it supports a claim that you discovered and formulated and that all of your discussion and explanation develops and supports. Defined-topic writing assignments are used primarily to identify your familiarity with the subject matter. Another writing assignment you’ll potentially encounter is one in which the topic may be only broadly identified (“water conservation” in an ecology course, for instance, or “the Dust Bowl” in a U.S. History course), or even completely open (“compose an argumentative research essay on a subject of your choice”). Where defined-topic essays demonstrate your knowledge of the content, undefined-topic assignments are used to demonstrate your skills—your ability to perform academic research, to synthesize ideas, and to apply the various stages of the writing process. The first hurdle with this type of task is to find a focus that interests you. Don’t just pick something you feel will be “easy to write about”—that almost always turns out to be a false assumption. Instead, you’ll get the most value out of, and find it easier to work on, a topic that intrigues you personally in some way. The same getting-started ideas described for defined-topic assignments will help with these kinds of projects, too. You can also try talking with your instructor or a writing tutor (at your college’s writing center) to help brainstorm ideas and make sure you’re on track. You want to feel confident that you’ve got a clear idea of what it means to be successful in the writing and not waste time working in a direction that won’t be fruitful. The following video provides an excellent overview of research essays, one of the most common kinds of writing assignments you’re likely to encounter in college. No writer, not even a professional, composes a perfect draft in her first attempt. Every writer fumbles and has to work through a series of steps to arrive at a high-quality finished project. You may have encountered these steps as assignments in classes—draft a thesis statement; complete an outline; turn in a rough draft; participate in a peer review. The further you get into higher education, the less often these steps will be completed as part of class. That’s not to say that you won’t still need to follow these steps on your own time. It helps to recognize that these steps, commonly referred to as the writing process, aren’t rigid and prescribed. Instead, it can be liberating to see them as flexible, allowing you to adapt them to your own personal habits, preferences, and the topic at hand. You will probably find that your process changes, depending on the type of writing you’re doing and your comfort level with the subject matter. 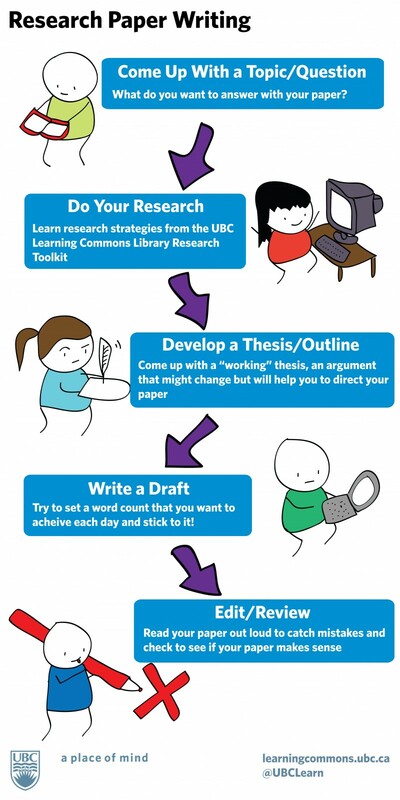 The flowchart is a helpful visualization of the steps involved, outside of the classroom, toward completing an essay. Keep in mind that it isn’t always a linear process, though. It’s okay to loop back to earlier steps again if needed. For instance, after completing a draft, you may realize that a significant aspect of the topic is missing, which sends you back to researching. Or the process of research may lead you to an unexpected subtopic, which shifts your focus and leads you to revise your thesis. Embrace the circular path that writing often takes! These last two stages of the writing process are often confused with each other, but they mean very different things, and serve very different purposes. Revision is literally “reseeing.” It asks a writer to step away from a piece of work for a significant amount of time and return later to see it with new eyes. This is why the process of producing multiple drafts of an essay is so important. It allows some space in between, to let thoughts mature, connections to arise, and gaps in content or an argument to appear. It’s also difficult to do, especially given that most college students face tight time lines to get big writing projects done. Still, there are some tricks to help you “resee” a piece of writing when you’re short on time, such as reading a paper backward, sentence by sentence, and reading your work aloud. Both are ways of reconceptualizing your own writing so you approach it from a fresh perspective. Whenever possible, though, build in at least a day or two to set a draft aside before returning to work on the final version. Proofreading, on the other hand, is the very last step taken before turning in a project. This is the point where spelling, grammar, punctuation, and formatting all take center stage. A person can be the best writer in the world and still be a terrible proofreader. It’s okay not to memorize every rule out there, but know where to turn for help. Utilizing the grammar-check feature of your word processor is a good start, but it won’t solve every issue (and may even cause a few itself). Your campus tutoring or writing center is a good place to turn for support and help. They will NOT proofread your paper for you, but they will offer you strategies for how to spot issues that are a pattern in your writing. Finding a trusted person to help you edit is perfectly ethical, as long as that person offers you advice and doesn’t actually do any of the writing for you. Professional writers rely on outside readers for both the revision and editing process, and it’s a good practice for you to do so, too. College courses offer a few opportunities for writing that won’t require using outside resources. Creative writing classes, applied lab classes, or field research classes will value what you create entirely from your own mind or from the work completed for the class. For most college writing, however, you will need to consult at least one outside source, and possibly more. The following video provides a helpful overview of the ways in which sources are used most effectively and responsibly in academic writing. Note that this video models MLA-style citations. This is one of several different styles you might be asked to practice within your classes. Your instructors should make it clear which of the major styles they expect you to use in their courses: MLA (Modern Language Association), APA (American Psychological Association), Chicago, or another. Regardless of the style, the same principles are true any time a source is used: give credit to the source when it is used in the writing itself, as well as in a bibliography (or Works Cited page, or References page) at the end.